This is either going to be the worst or the best thing you’ve done seen today. 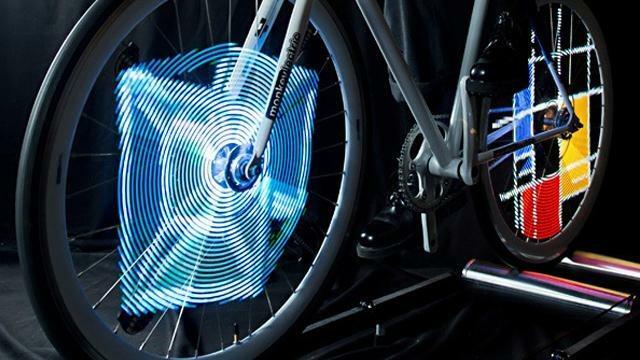 MonkeyLectric, the company behind those LED lights you can attach to inside your bike’s spokes to make them look cool at night, has launched a Kickstarter campaign so you can get the system to display animated GIFs. That’s GIFs – hard G, soft G, whatever you prefer – on your bikes, also known as in real life. Again, it’s either going to be amazing or totally obnoxious. On the awesome front? Until now, the Monkey Lights system comes with preloaded graphics so you can zoom through the night while displaying LED images of space invaders, hearts, or words. With the new Monkey Lights Pro, you can upload custom animated graphics to truly personalize your bikes. Supported files include JPG, GIF, PNG, AVI, MPEG, MOV, QT, and FLV so you literally play any clip you want while you ride as long as it does not exceed 1,000 image frames per clip. The system will also recognize acceleration speeds to emit pre-determined graphics, like Fast Forward symbol for quick rides, Play symbol for regular cruises, and Stop symbol for breaks. The wheels can show off graphics in full color, utilizing 256 bright LED shades, and can run for up to eight hours in one charge. If you run them with minimal brightness, the battery life extends up to 48 hours. For each wheel, the setup comes with two-axis accelerometer and four magnetic sensors to track the rotation. This all ensures the images display clearly and does not sputter as the rider changes speed or ride backward. So how is it going to be terrible? Well, let’s face it, the GIF era has hit its peak. You can only see so many Nyan Cats on the Internet on any given day, but now you may have to see them roaming the city on hipster bikes? The Web and reality need to stop blurring their territorial lines. If you’re one of those who are interested in the Monkey Lights Pro, just promise not to be annoying with them and it’s all good. The system will retail for $895 per wheel ($1,690 for a set), but if you back the project before July 21, there are still a couple of early bird pricing pledges left. Monkey Lights Pro is expected to ship by December of this year.